Kind beyond measure, Bertha Boverhof modeled a life of being the most loving and devoted sister, wife, mother, grandmother, and great-grandmother. Generally a quiet and shy person made her the most wonderful listener. Her warm spirit and soft-hearted ways will be dearly missed and fondly remembered by her special family and all those who loved her. The 1920s saw the large-scale boom of automobiles, telephones, and motion pictures, as well as unprecedented industrial growth and significant changes in our nation’s culture. At a time when Lou Gehrig and Amelia Earhart were household names, Bernard and Elsie (Heyboer) Hemmes welcomed home the sixth of their eight children, their baby girl, Bertha, on July 7, 1928, in Grand Rapids, Michigan. She brought great hope and promise to an exciting time in our nation’s history. Growing up the southwest side of town, near Grandville Avenue and Lee Street, Bertha lived a typical childhood of the Depression era. As a young child, diagnosed with a thyroid condition she was allowed to eat as many sweets as she desired. She developed an insatiable appetite for homemade donuts, caramels, milk chocolate, black licorice as well as all types of hard candies. Bertha attended school through the ninth grade and then took a job with Heckman’s cookie factory where her addiction to sugar continued. She remained especially close with her siblings during her growing years crediting her solid foundation of faith with Lee Street Christian Reformed Church. Not to be forgotten was a period in her life where she and her cousin caught a ride from William "Bill" Boverhof who was cruisin’ the “circuit” around town. She was somewhat apprehensive about him at first and therefore told him her name was Joyce. It wasn’t until later when he was meeting her family for dinner for the first time did he learn the truth! 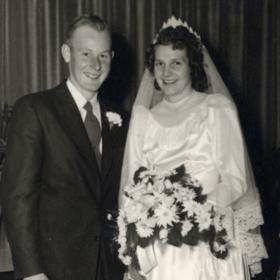 Quite smitten with one another, they joined in marriage in October of 1950. Chicago was the perfect setting for their honeymoon where they stayed with relatives with a short stop off at Hess Lake. 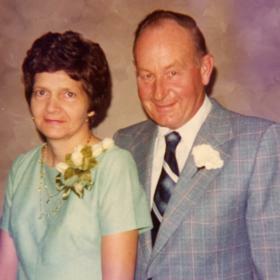 The newlyweds made their home in Wyoming where Bill was working as a builder. Through the years, he would build a house, live in it for a short time until the next one was ready, so the young family with six children moved roughly seventeen times! Bertha became rather efficient in her ability to load up their household goods in record time! Organized and full of energy, she learned the ins and outs of being a contractor's wife and purging items with each move to make them more efficient. After getting settled into another home, they’d often sneak away by going camping in Michigan’s beautiful Upper Peninsula. They also managed trips to Arizona to visit extended family. Much like her upbringing, she and Bill raised their kids with a strong faith life at 36th Street Christian Reformed Church. As a mother, Bertha was a meticulous homemaker. 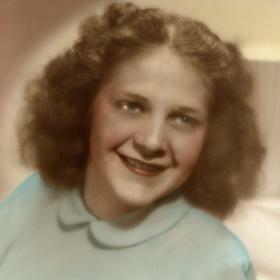 She loved to cook, often baking homemade goods of various sorts. Waking up to fresh bread and donuts on Saturday mornings or helping can and freeze fruits and vegetables to last through the hard winters, became some of her children’s favorite memories. In addition to her talent in the kitchen, she was more than hospitable to family members who needed a place to stay. Their home often had an extra guest staying with them, such as her parents, grandparents, or her mother-in-law. Each person was made to feel special and included in their day to day activities. Whenever she needed to thank someone or send them on their way, she’d often pack up some of her delicious canned or baked goods to share. After the children were grown, she and Bill were provided with the gift of time. They both enjoyed years of traveling together. At times, they were accompanied by her sisters and their husbands on long road trips throughout the United States. Remaining close to her sisters, Bertha often joined them each week for a game of cards. With the extra time, she held many special interests. She was a very talented seamstress and loved to make doll clothes as well as crochet afghans. Most of her crafts she ended up giving away as gifts. Her many special hobbies kept her active because if she sat still for any length of time, she’d fall fast asleep! After more than forty years, she and Bill left their city living for a home on property near Hess Lake. She had a hard time getting used to it, but appreciated the space that the extra land provided. Here, she and Bill loved to have their grandchildren over to make wonderful memories with each and every one of them. 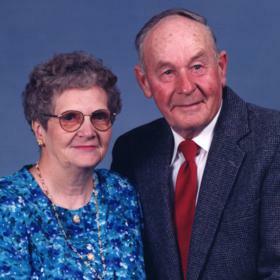 Bertha had a very difficult time when her loving husband, Bill passed away. Perfect companions, his loss left her struggling to find her independence. To pass the time and keep herself feeling needed, she often volunteered to give people rides to the grocery store or to Pine Grove Christian Reformed Church. She wanted nothing more than to live her life selflessly giving of her time and her many resources expecting nothing in return. 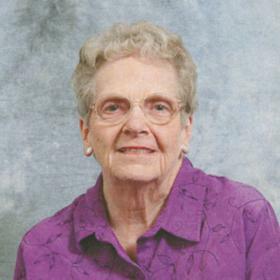 Bertha was wonderfully cared for by her family as her illness with cancer progressed. She will be remembered for her thoughtful ways, her ability to accept others, and her unconditional love.